Thank you for joining me as we count down to the MFT release. We are four days away from the big day! All the new Stamps and Die-namics will be available on Tuesday, November 7 at 9:00 pm EDT. Be sure to check out the MFT Blog to see all the new items being revealed today. Don't forget to leave a comment on the MFT Blog countdown posts, YOU could win one of the five $75.00 gift vouchers. I have a sweet and simple card to share with you today. It features one of the sweet girls from the New Best Friend stamp set. I stamped the image on a piece of X-Press It card stock and coloured it with Copics. The image was mounted on a couple of Stitched Mod Rectangles. I sponged on Faded Jeans Distress Ink on Smooth White card stock to create the denim rectangles. 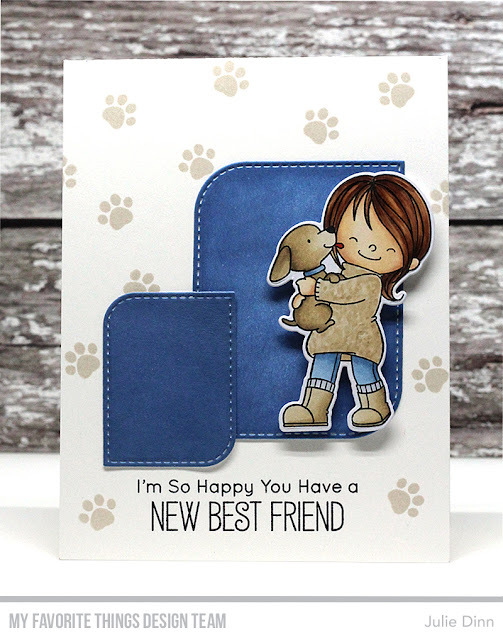 I stamped the background with one of the small paw print stamps for the New Best Friend stamp set. Be Still my heart! I love this card! You are the best design team ever!!! Thanks for the inspiration! This is such a cute card ! Gosh that looks just like denim! Gorgeous, how did you get that great texture on the jumper ? Such a super cute card! !